When it comes to softness comparing bamboo and cotton would be like comparing apples and oranges! Bamboo fiber is naturally sumptuously soft but the quality of the construction also has effects. 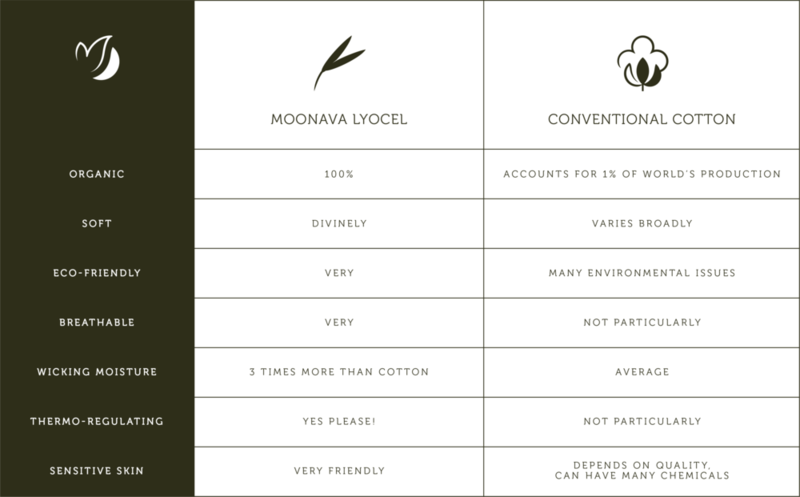 Moonava exclusively uses high quality single-ply yarn which make our 100% organic Bamboo lyocell sheets irresistibly soft, light and strong. Our luxury fabric has a Thread Count (TC) of 300 threads per inch - that is the number of threads woven together in a one inch square. There is a limited number of threads can fit in a single square inch. Many traditional bed sheets makers use tricks to augment the number of TC by weaving coarse Multi-Ply yarn - weaker lower grade fiber twisted together. This artificially higher TC degrades the quality, softness and strength. It's what's between the thread that counts! Facts are here, the choice is yours!